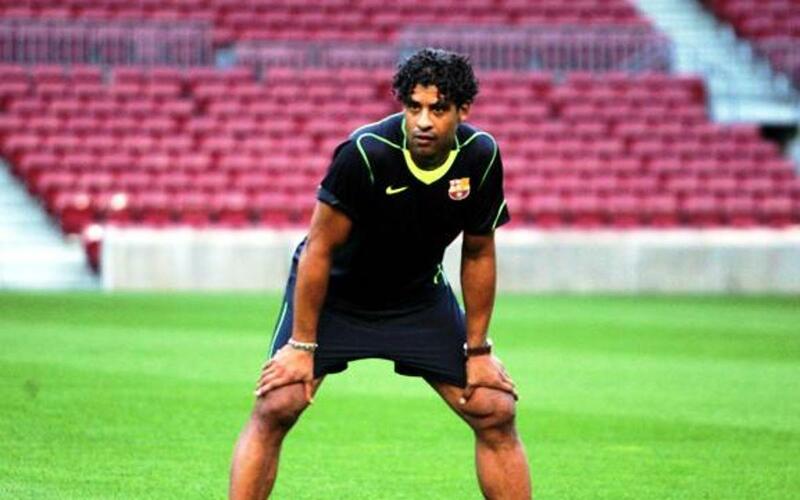 Rijkaard, who came to Barça with the reputation of being a calm, sensible and honourable man, began his time in charge alongside fellow countryman Henk Ten Cate, ex-coach at Nac Breda, and Eusebio Sacristán, ex-member of the Dream Team, as assistant coaches. The Rijkaard era began in 2003-04, with Ronaldinho as the big star on the pitch. The club had had four barren seasons and was playing in the UEFA Cup. After a poor first half to the season, the signing of Dutch midfielder Edgar Davids in the January transfer window was a turning point. The coach consolidated his tactical system and the team climbed up the table to finish second in the League, something which had seemed impossible in the darkest moments. Knocked out of the UEFA Cup by Celtic and the Copa del Rey by Zaragoza,, Barça finished the season with just one title in the shape of the Catalan Cup, but at the end of the day had showed there was hope for the future. In the 2004-05 season the team made a qualitative leap with the arrival of stars such as Eto’o, Deco, Larsson, Giuly, Edmílson, Belletti and Sylvinho. Despite four serious injuries in the first part of the championship (Motta, Gabri, Edmílson and Larsson), Barça overcame the difficulties and with attacking football won the League with authority. The title was won away at Levante with three games still to go. The side also won the Catalan Cup that season, having been knocked out of the Champions League and the Copa del Rey by Chelsea and Gramenet respectively. The pinnacle of Rijkaard’s achievement came in the 2005/06 season. His side dazzled Europe with memorable performances at Stamford Bridge (1-2) and San Siro (0-1), before winning the club’s second Champions League title in Paris against Arsenal (2-1). Barça also retained their League title with some spectacular football which included a winning streak of 14 games (including a 0-3 win at Bernabéu which led to them being applauded by the Madrid fans). They also won the Spanish Super Cup by beating Betis, with the only negative point being elimination from the Copa del Rey at the hands of Zaragoza. At an individual level, in that virtually unsurpassable 2006 Rijkaard was chosen World’s Best Coach by the International Federation of Football History and Statistics (IFFHS), ahead of José Mourinho and Juande Ramos. The 2006-07 season was a disappointment. Knocked out on the away goals rule by Liverpool in the last 16 of the Champions League, goal difference deprived Barça of its third League title in a row. Also painful was elimination from the King’s Cup in the semi-finals by Getafe. Moreover Sevilla and Internacional de Porto Alegre defeated Barça in the European Super Cup and the Club World Cup respectively. The Spanish Super Cup and the Catalan Cup were the only titles to be won that season, with Espanyol as the runners-up in both cases. The summer of 2007 saw the arrival of Henry, Touré, Abidal and Milito which in principle meant Barça had one of the best squads in its history. The team was one goal away from both the Champions League final and the Copa del Rey final, with Manchester United and Valencia putting out the Catalans who perhaps deserved better on both occasions. In the League the team was unable to achieve the consistency required due to physical wear and tear and injuries, and ended up in third place. On 8 May 2008 the club announced a change of coach: Frank Rijkaard was to be replaced by Josep Guardiola. In spite of two adverse years, the Dutch coach left with an excellent record: two League titles (2004-05 and 2005-06), a Champions League (2005-06), two Spanish Super Cups (2005-06 and 2006-07) and three Catalan Cups (2003-04, 2004-05 and 2006-07). In addition to these titles, with Frank Rijkaard FC Barcelona recovered an identity and style of playing which enabled it to rejoin football’s top flight both in Spain and in Europe. Rijkaard managed Barça in 283 official games, with 167 victories, 64 draws and 52 defeats, scoring 544 goals and letting in 254. His win percentage was 59%, with an average of 1.92 goals scored and 0.89 conceded per game. His 112 victories in the League put him in third spot as a Barça coach in this competition behind Johan Cruyff on 183 and Pep Guardiola on 116. Rijkaard began his coaching career at the 1998 World Cup as assistant to Guus Hiddink with Holland. Between 1998 and 2000 he was the Dutch coach, and in 2001-02 managed Sparta Rotterdam. Rijkaard had an exceptional career as a player. He graduated from the Ajax youth academy and played for the Amsterdam outfit between the 1980-81 and 1987-88 seasons. In this latter season he also played for a few months at Real Saragossa, totalling 11 matches. Most of his greatest successes came with AC Milan between 1988 and 1993, before rounding off his career as a player back at Ajax. The trophies he won as a player include the European Championships with Holland (1988), three European Cups (88-89, 89-90 and 94-95), the Cup Winners’ Cup (86-87), three European Super Cups (1989, 1990 and 1995), two Intercontinental Cups (1989 and 1990), five Dutch leagues (81-82, 82-83, 84-85, 93-94 and 94-95), two Italian leagues (91-92 and 92-93), two Italian Super Cups (1989 and 1994) and three Dutch Cups (82-83, 85-86 and 86-87).